Two former England footballers have been arrested in connection with the taking of a limousine. Rob Lee, 38, and Warren Barton, 41, were held after the Mercedes E220 saloon was taken from Hackney Road, east London, on Tuesday night. The car was found abandoned in the same road, having collided with a van. The former Newcastle United players were later arrested at two addresses. They have been released on police bail until September. They were being held over allegations of taking a vehicle and driving while unfit. Officers are also investigating reports that a satellite navigation system and a mobile phone were stolen from the vehicle. 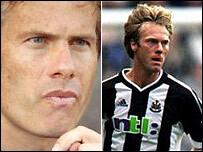 Lee, from West Ham, east London, was a player at Newcastle United for 10 years and was capped for his country 21 times. Barton, born in Stoke Newington, played for the Magpies between 1995 and 2002, and played for England three times.